The Suzuki SX4, foreground, is an example of AWD fun in ice and snow, while the Ford Fiesta sedan proves front-wheel drive also has winter advantages. When the auto industry changed over from the traditional front-engine/rear-drive to front-wheel drive, it not only provided flat floors and more spacious interiors, it instantly eliminated most of the treachery of winter driving, because of having the majority of weight over the wheels that not only drive the cars but do most of the braking and all of the steering, too. Then along came all-wheel drive, which used to be available only on Audi and Subaru models,Â or otherwise required a truck or sport-utility vehicle to enjoy. But as we drive, slide and skid through this Upper Midwest winter-that-never-ended, it is worth noting how all-wheel drive has proliferated through the car industry. We’ve come a long way from the old truck-style 4-wheel drive that sent equal power to the front and rear axles, which meant that drivers could feel a tight binding up of the front wheels during a sharp turn, where the inside wheels don’t travel as far as the outside. Contemporary all-wheel drive adjusts power front and rear, as electronic components measure the tendency to spin, but also can alter the torque going from inside wheels to outside, in many cases. When winter chose to send a last blast across the Upper Midwest to prove that March can still “go out like a lion,” it offered the chance to prove again how some cars perform well in winter, some don’t, and how some that would perform well on icy roads need better tires to do so. Consumers, and manufacturers, tend to forget that tires remain the only four contact points a vehicle has with the roadway, and suspension systems and tires that can make a car handle with great precision on dry roads might reduce rear-drive, front-drive and even all-wheel drive cars to white-knucklers in a storm. 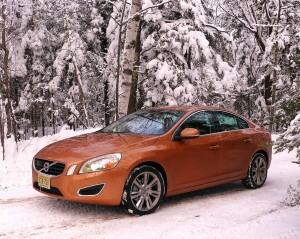 Redesigned Volvo S60 has power, comfort....and all-wheel drive. Audi S5, A4 and A8, Cadillac SRX, Nissan Juke SV, Lincoln MKS,Â Subaru Impreza WRX, Volvo S60, Mitsubishi Evolution MR, Infiniti G37X, Ford Fusion, Taurus SHO, Suzuki SX4, Toyota Scion xD,Â Acura TL, and the Mercedes CL550 4Matic, and E350 4Matic wagon, and Porsche Panamera. Crossovers and SUVs that fit under the largest category were more predictably strong in foul weather, including the Ford Edge and Explorer, Chevrolet Equinox and Traverse, Dodge Durango and Nitro, Subaru Forester and Tribeca, Range Rover and Land Rover LR4, Volkswagen Touareg and Touareg Hybrid, GMC’s Terrain and Acadia, Porsche Cayenne, Hyundai Tucson, Kia’s Sorento EX and Sportage, Jeep’s Grand Cherokee and Patriot, and Mazda’s CX-7 and CX-9. There was one overriding theme of all those vehicles: All of them have all-wheel drive. That may be cheating when it comes to comparing driveability in wintertime, but if you’ve ever known the terror of spinning out, skidding, or being unable to stop and steer. In those cases, a little cheating goes a long way toward security. When people think about traction on snow and ice, they usually think about being able to go. Stopping and steering, of course, are just as important. The listed vehicles had good timing, proving exemplary in their driving conduct while also being in my possession in Minnesota snows and ice. Numerous front-wheel-drive cars also did just fine in snow, depending on their tires. 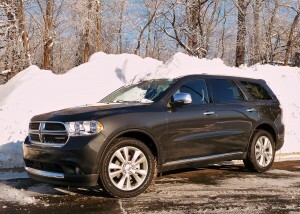 Dodge Durango Citadel, with AWD, conquered winter far better than its sister ship with FWD. Fortunately (fortunately?) this particular winter provided a record number of valid winter-driving tests for whatever vehicles were in my command at the time. 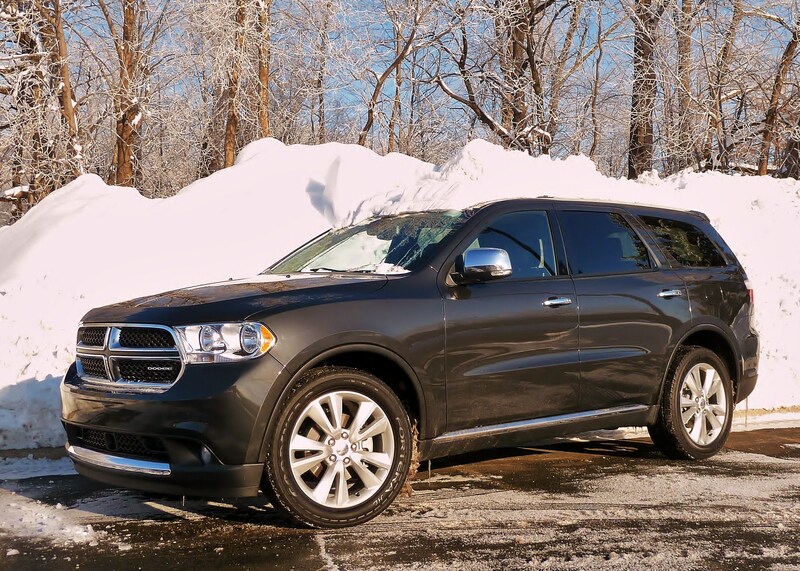 While not listing the assorted large pickups and SUVs that are generally over-qualified for foul-weather driving, the new Dodge Durango is included, because it was noteworthy in AWD form,but genuinely scary on ice with only RWD. You don’t have to have AWD to survive winter driving, but it is a tremendous help. Some rear-wheel drive cars surprised me by being workable in winter — with the right tires. They included a Jaguar XF with RWD, but it was shod with Continental ProConti Contac tires, that harnessed its V8 power and made it passable in icy weather. Same with an Infiniti EX35, which is available with AWD, but happened to show up with RWD only, although its console switch that allows toggling to a “snow” setting made it pretty good, with good all-season tires. As tires go, the Mitsubishi Evolution MR is a hot rod, but it had Dunlop WinterSport SP tires that kept it churning forward at all times. Same with the Subaru WRX, which had Dunlop WinterSport tires. Those tires impressed me, and moved up into the category I had reserved for Nokian WRÂ and Bridgestone Blizzak tires, my standards for surviving the most hazardous winter driving. Same with the Mercedes CL550, which, along with the Evolution, were subjects of specific earlier reviews. Some other cars fell short of expectations. 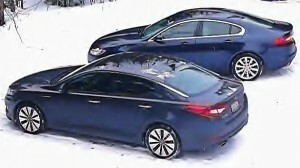 The Kia Optima, for example, is an outstanding car for design and function, and I assumed it, along with partner and parent Hyundai with its Sonata, would be strong front-wheel drive winter runners. But I was left with the feeling that the Koreans might be more loyal than thoughtful when they send their cars to places like Minnesota. The Kia Optima SX 2.0Turbo that I drove for a week was an outstanding car, but its Nexen tires, which are reportedly good for quality control and long wear, transformed the front-wheel-drive Optima to a slippery critter in a snowstorm. Similarly, the new Ford Fiesta is a quick and agile subcompact with front-wheel drive, but it came with Hankook Optimo tires, and on ice and snow it was greasy and slithery, while also suffering from wind-buffeting on the freeway, although I found out later that the wind that day was blowing west-to-east with major league gust velocity. Toyota's Scion xB had tires that wanted to spin, despite FWD, while the xD was more stable. Avalon, Nissan Altima, Honda Accord and Toyota Camry and Corolla, as well as Mazda2, Mazda3, and Volkswagen’s Jetta and CC also were FWD cars that handled storms with ease. The new Scion xD was excellent, but a Scion xB, with Toyo tires, was far from excellent, spinning freely whenever confronting a few snowflakes. A Toyota Prius got great fuel economy, but its narrow tires were unstable when confronting freeway grooves, and less than ideal in snow. In all the cases where FWD cars did not have top-level all-season tires, I would recommend consumers barter for them with the dealers at the time of purchase. Make a stand that swapping out slippery tires for Nokian WR-G2 would make a good deal-maker, and the top Continental or Dunlop winter all-seasons make sense too. Otherwise, buying an aftermarket set, or selecting Blizzaks for winter only, would make any front-drive car, such as the Sonata or Optima, an outstanding winter car. While those tires might be expensive, it is the least-expensive insurance available for peace of mind. Kia Optima, front, has FWD, and style resembling Jaguar XF, with RWD. to the Twin Cities, I got there just as a major storm was starting. The Jag XF was similar; I drove that for the same week as the FWD Kia Optima SX, which, while slippery because of its tires, tracked much better on ice than the RWD Jag XF. On the other hand, the Audi A8 simply seems unaware there was any foul weather. It costs over $80,000, and it comes standard with Audi’s quattro all-wheel drive. The smaller A4, and the sporty S5, also have quattro, at much more reasonable prices. The Audi S5 was fantastic on the few days of dry pavement, and surprisingly good when weather switched to a major snowstorm. The S5 looks like an exotic sports coupe because it is. Audi’s upgraded A5 coupe has all sorts of high-performance equipment, including a 4.2-liter V8, and is intended to challenge the BMW M3,. The test vehicle came in bright red, and had a 6-speed stick shift, along with Audi’s revised quattro all-wheel-drive system. I was pretty sure that I could make it through any blizzard without concern in the S5, but I also knew it had so much power that it would have to be applied with care. When I looked, I saw it had been re-equipped with low-profile Blizzak tires, which meant it was ready for anything. The Nissan Juke deserves special commendation. It comes in various forms, and it remains an unusual-looking little beast, as though it can’t decide if it wants to be an ultra-compact SUV, a useful mini-wagon, or a sports car. The one I happened to have for a week when a 20-inch snowstorm hit was the top of the line, with a 1.6-turbo and all-wheel drive. I knew it would do the job when I realized it had AWD, but I had to discipline myself to hook up to the special features. A switch on the console allows you to go from Eco to Normal to Sport. While you can get the Juke with a stick shift in FWD form, the automatic that comes with the AWD is a continuously variable transmission (CVT), and Nissan deserves great credit for developing its CVT so that it can be switched away from a too-mellow and boring drone to something that can even be manually shifted to pinch down on the transmission belt as though changing to a different gear ratio. 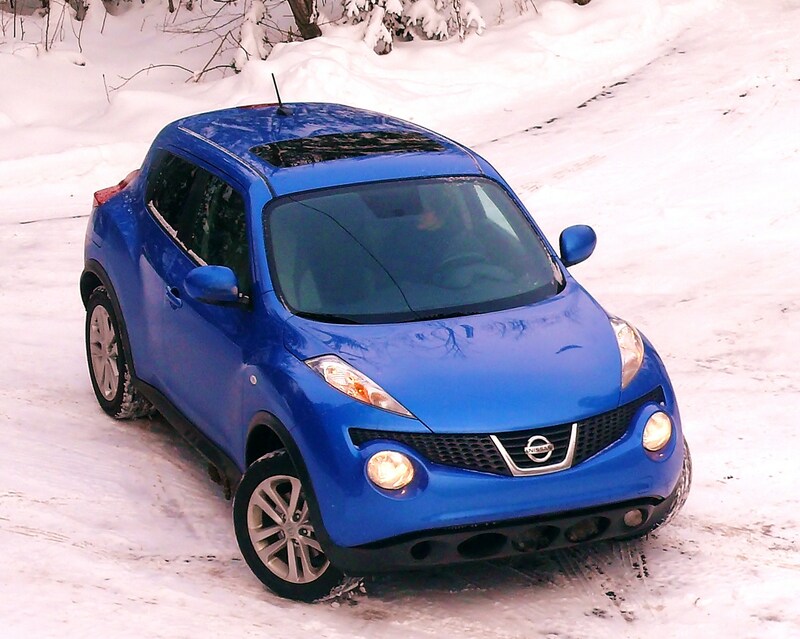 Nissan's new Juke SV has AWD and switches to adjust power, ease -- and evenÂ fun -- in heavy snow. Clicking the Juke into Eco was OK, but quite mellow. Clicking to Normal made it run with a more sporty attitude, revving higher and feeling more sprightly. But switching to Sport truly transformed the Juke. It stiffense up the suspension, forces the transmission to allow more revs if you have the automatic, and even firms up the steering feel. It was much more fun to drive in that attitude, even during and after a 20-inch blizzard hit Duluth. It was almost like having an all-terrain vehicle with a secure cockpit, which also cruised easily on the freeway. And it still delivered 26 miles per gallon, combining the freeway trip with churning up half-mile hillsides. There were a couple of unusual issues, which made me realize that nobody knows for sure what will happen when all of our ultra-high-tech electronic gizmos venture out into subzero cold. I have two examples in mind. First, a Ford Fiesta with all the neat Sync things and connectivity stuff that Ford is equipping its cars with for 2011, was impressive, and I suggested my wife, Joan, drive it to work on a 20-bwlow-zero morning. She called on her cellphone minutes later and told me the Fiesta had run slower and slower until she stopped on the shoulder of Hwy. 100. Now, Hwy. 100 on the west side of Minneapolis resembles the drafting trick on a race track much of each day, and at morning rush-hour it is a combination of race track and gridlock. The shoulder is not a comfortable place to be, but walking to a better location was out of the question, since it was 10-below zero. She said the engine was still running, without enough revs to move. I suggested shutting off the ignition and restarting, like rebooting a computer, but she was reluctant to shut it off, because she could still get heat from it. I told her I’d be there in a flash, but before I left, I called Morrie’s Minnetonka Ford, and got through to Glen Saunders in service. I told him exactly what had happened, and that it was a factory car provided for a road-test. He said he’d see about getting a tow truck there immediately. I started driving, but I had only gone a block when Joan called and said she gamble and shut it off, then restarted it, and everything seemed fine. So she was off. I called Minnetonka Ford back, and Glen Saunders said he already had a tow truck on its way. I was relieved to be able to thank him and to tell him to call the truck back. I also was impressed that he had scrambled a rescue truck in a matter of 5 minutes. Anyhow, the Fiesta was fine thereafter, except once, when it repeated its same balky trick. I’m convinced the electronics were all in there huddled together in Sync devising a driveability protest against being asked to work in such cold. 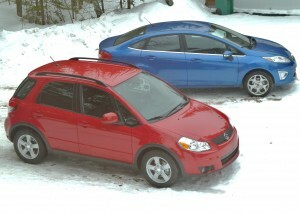 The Suzuki SX4 looked warm, and it was, idling in 20-below weather with self-locking doors. 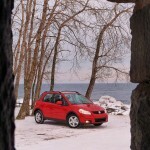 Then there was my test of the Suzuki SX4, one of my all-time favorite blizzard-mobiles. 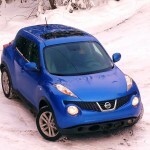 The AWD hatchback was in a class of one, at least until the Juke came along, for cavorting through blizzards. 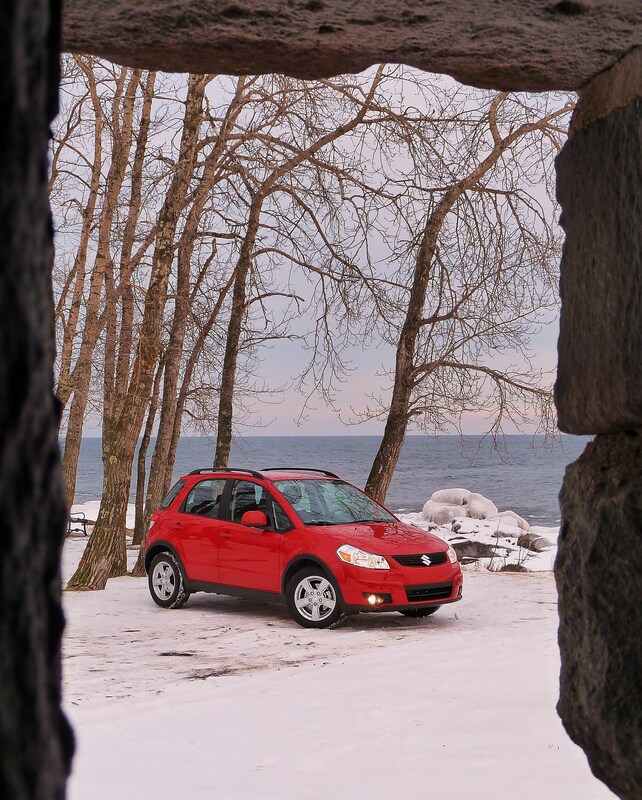 A bright red SX4 was delivered to me during a heavy storm in Duluth, and as I drove it out along the stormy North Shore of Lake Superior, I decided to stop at a popular summer roadside spot near the water and use the blue water and icy boulders as a photo backdrop. I thought the bright red SX4 would look best with the headlights and foglights on, so I left it idling after parkilng near the water.Â I hopped out, braced against the nasty wind and subzero cold, but knowing I’d only have to weather it, so to speak, for a couple of minutes. I snapped a half-dozen photos hurriedly, then I walked around the SX4 to climb back in — and found all doors were locked. The car had keyless entry, but not keyless ignition. The key was in the ignition, because the car was running, while I was outside, facing the wind. Fortunately, this is one of those years where we do more shopping at Eddie Bauer’s than at Macy’s, and I was wearing my amazing new down parka. Fortunately also, I had my trusty iPhone, and after a few calls, I got through toÂ Lakewood Towing, where Big Mike answered. Quite remarkably, I had met Big Mike about a week earlier, when a fellow driving to meet me from Chicago turned in a neighbor’s driveway and got stuck. I tried to help just after the neighbor summoned Big Mike, and he arrived quickly to extricate the car. He remembered me from that incident, and was more than neighborly in scrambling to get to my location in about 20 minutes. He used his neat little flat metal device to push down on the power window switch far enough for me to reach in and unlock the door. Later, someone at Suzuki said that for security, if the engine is running and the doors are closed, the SX4 determines that someone must be in the car, and it electronically locks all the doors. In Minnesota winters, that’s outrageous. When it’s 20 below, many people do as I do, start the car and let it warm up while getting back out to scrape ice from the windshield, or else they leave their engine running to maintain interior heat while they fill the gas tank — which is a no-no, but happens frequently in the Great White North. In all such cases, the driver would return to the driver’s door to find his SX4 locked, and running merrily. Other cars have devices that won’t allow the doors to lock if you leave the key is inside. Others beep a loud and annoying warning if you open the door with the key inside. In the case I experienced, aside from truly appreciating someone like Big Mike, and Eddie Bauer, the best news is that the car’s heater will have the interior really warm after idling for a half-hour. The very heart of your writing whilst appearing reasonable initially, did not settle very well with me after some time. Somewhere within the sentences you managed to make me a believer unfortunately only for a short while. I nevertheless have got a problem with your jumps in logic and one would do nicely to help fill in all those breaks. In the event you can accomplish that, I would surely be fascinated. I enjoy what you guys tend to be up too. Such clever work and coverage! Keep up the superb works guys I’ve added you guys to blogroll. I’ve read a few excellent stuff here. Definitely worth bookmarking for revisiting. I wonder how a good deal effort you determine to create this kind of wonderful informative website.